Have you got old/non-working computers? If you do and want a new computer, Concepts has a deal for you. 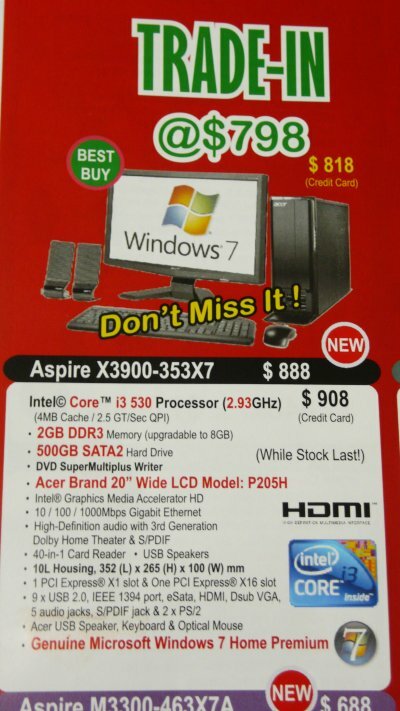 Trade in your old computer at get an Acer Aspire X3900 – 353X7 for B$798 (B$818 with card) which is a B$90 discount for your old computer. The monitor has a resolution of 1600×900 and a standalone cost of B$248 (or B$198 bundled price with a computer) and I believe this is a good deal and the computer is ideal for general / family use. Update 1: Kudo’s to Concepts for allowing me to tickle my fancy of wanting to know how many SATA connectors there are. 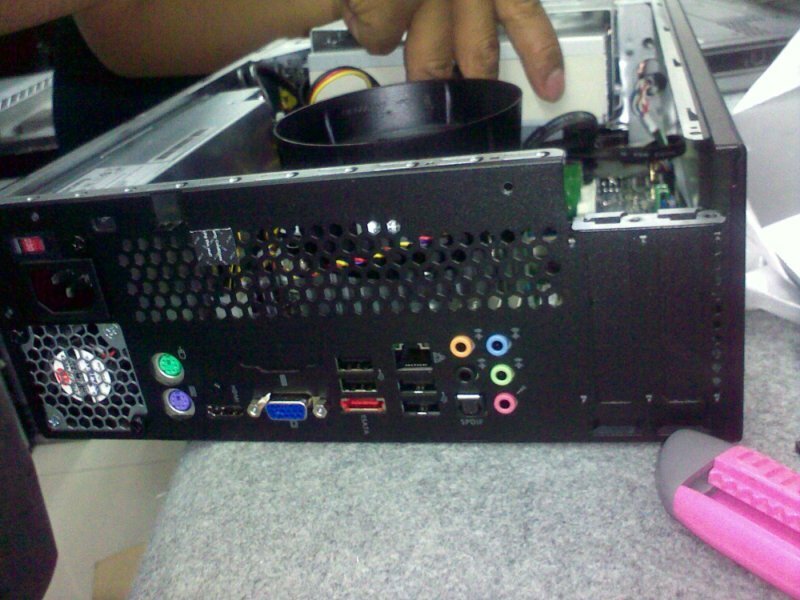 I asked if I could transplant the system in an existing chassis and they even offered to do it for free. So if you do transplant the system you can use normal sized components but the next issue that you could run into would insufficient power to the component. Stock power supply is only 220W, so if you put in a power hungry graphics card you will have to spend more on an extra power supply too. Possibly add another $200 – $300 for that. Update 2: So you can upgrade the RAM to 4GB for B$98. (2 sticks of 2GB which is a added nice touch as it means you can max out the RAM without getting rid of any sticks, if they used 4 sticks of 1GB RAM). Also my brother seems to be having an issue with this brand new system. Monitor detected that the video signal was lost, then the power button kept blinking. Tried moving the mouse, pressing the keyboard, pressing the power button and none of that worked. Had to force shutdown and also during a restore, the restoration got stuck.